I recently explained that the so-called tax scandal of the century really was nothing more than the expectable consequences of bad government regulations and unbearable taxes. While media keeps their spotlight on this non-event, a real European tax scandal is unfolding right before our very eyes. The commission, earlier this year, pointed the finger at Belgium, Cyprus, Hungary, Ireland, Luxembourg, Malta, and the Netherlands, where it said sweetheart deals may have enabled multinational companies to cut their tax bills aggressively. The finance and taxation commissioner, Pierre Moscovici, said, at the time, that tax rules in those seven countries "have the potential to undermine fairness and the level playing field in our internal market, and they increase the burden on EU taxpayers". Some multinational companies have made extensive use of Ireland and other EU countries to shift profits and avoid taxes. With this initiative, the commission aims for faster adoption of proposals. The European Union has created a new kind of blacklist of 17 jurisdictions, and a “watch list” of another 47, branded as “tax havens” or “noncooperative” countries and territories. This list, which has been long in the making, vilifies countries and territories for no other reason than providing residents and investors with low taxes and financial privacy. Not only is there a substantial difference between Europe’s highest and lowest taxed countries, but the difference is growing. In 2002, taxes as share of GDP were 31 percent higher in the highest-taxed countries than in the lowest-taxed one; in 2017 they were 48 percent higher. Several countries aspire for the title as Europe’s highest-taxed nation. Norway, Finland and Belgium are trying to prove that when it comes to taxes, the sky is the limit. Ireland and Romania are pulling in the opposite direction, establishing themselves as Europe’s own low-tax jurisdictions. In Romania, a 2005 tax reform substantially reduced income taxes from a progressive tax with a 40-percent top rate to a 16-percent flat rate. Corporate “profit taxes” were cut from 25 percent to 19. At the time, the Romanians were planning another tax cut. With its new initiative, the EU is seeking to force feed its high taxes to every country under its boot. According to Eurostat, in 2016 the average rate for the EU was 44.6 percent. Where is it going to be when the EU gets to force-feed high taxes down the throats of Europe's lower-taxed nations? Irish taxes take 27 percent of their GDP. In Romania the ratio is 31.9 percent, with 34.4 percent in Lithuania, 35.3 in Bulgaria and 37 in Latvia. How high will taxes go in these countries? 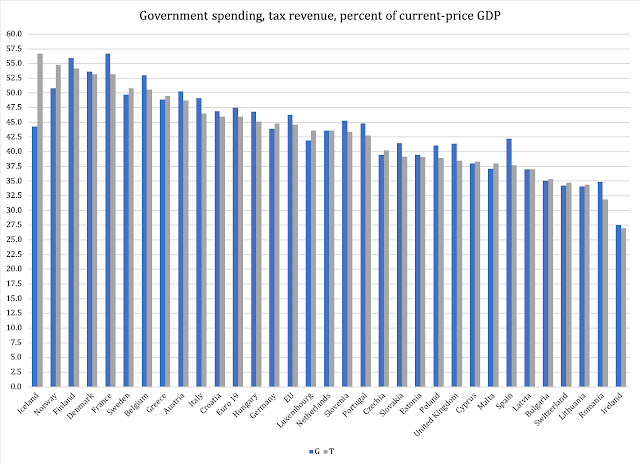 For comparison, a total of eleven EU states had a heavier tax burden than the EU average, with Finland, Denmark, France, Sweden and Belgium taxing away more than 50 percent of GDP. Europe is suffering under its increasingly aggressive high-tax cartel, but it is also paying the price for its own welfare statism. This new EU Commission initiative only reinforces the price to be paid for that ideological choice; as the European economy continues to sink under the weight of the world's highest taxes, that price tag will increase exponentially. What lies ahead is a hinterland of economic stagnation and industrial poverty. The only silver lining in this is the fact that the EU Commission has made its intent known way in advance of the planned implementation date in May 2019. Investors who are concerned about the harm of high taxes and economic stagnation, will have time to rearrange their portfolios. Unfortunately, Europe’s middle class does not have that option. They will be the big losers as the Eurocrats in Brussels get ready for yet another tax attack on the forces of economic freedom and prosperity.